This book is a lobster. Protagonist and supporting characters who you’re pretty sure are lying to you and to each other? Dialog that can be inferred in multiple ways? Not much of a pay-off at the end? Feel like you need to read the whole book again to figure out what’s going on? If you answered Yes to all those questions, you might be reading a Gene Wolfe. In classic Wolfe fashion A Borrowed Man answers all those questions with a resounding Yes, and I’m tempted to read the whole thing again, just to see what additional hints I can pull out. In the far future, not only can you take discs out of the library, but you can take an entire person out the library. Famous authors, artists, and poets have been “re-cloned” – they talk like a person, act and walk like a person, need to eat and sleep like a person, are a person, but are owned by a library. Reclones are property. When someone takes out author A.E. Smithe, he has no choice about what they do with him. But if enough years go by with no checkouts? He might get sold at a library discards sale, or he might get tossed into the incinerator without a second though. To Smithe, his life is normal. He lives on a shelf in the library, he gets up every day and washes his hair and has breakfast. He paces, he reads, he fights with his ex-wife. If no patrons come to consult you, life is easy but boring. Smithe remembers everything (or nearly everything) his original remembers, but he also remembers everything he’s experienced since becoming a reclone. Many libraries have E.A. Smithes, all with the same core memories. Reclones are forbidden from writing or creating art, it would cheapen what their originals did. Yet, A Borrowed Man is told in first person, so . . . is Smithe writing this story? Regardless of who is writing this story, Smithe gets taken out of the library by one Colette Coldbrook, who says she needs his help solving a mystery. Both her father and brother were recently killed, and the only thing found in her father’s safe was a copy of the book Murder on Mars written by E.A. Smithe, yet our Smithe has no memory of every writing it. Are his memories incomplete? Was the book actually written by someone else (a law-breaking reclone, maybe?)? Thrilled to be out of the library for a few days, Smithe goes along with whatever Colette says, even when she can’t keep her story straight. If she likes him enough, maybe she’ll buy him. Maybe he’ll never have to go back to the library and he can live in this huge mansion forever. She’s trying to figure out what happened to her secretive father, and she’s convinced the secret to his financial success is hidden in the book that Smithe doesn’t remember writing. No spoilers, but the secret IS in the book, just not in the way you (or Colette or Smithe) are thinking. I didn’t find Colette all that interesting, but I was fascinated by the concept of reclones. There is a scene where Smithe ends up at a different library, and runs into a different reclone of his ex-wife Arabella. Their interaction is rather uncanny, because it’s the same as all their interactions – she’s happy to see him, and then they start fighting. Do they know they are repeating this scene over and over? Everything about the reclones is absolutely fascinating. Just past the half way point, the novel takes an unexpected turn towards, I can’t even explain it because it would be a huge spoiler and it would make absolutely zero sense out of context. Let’s just say that after that point the plot revolves around figuring out the off the wall thing that just happened that has a lot to do with the book that Smithe doesn’t remember writing. This portion was more interesting and weird and very WTF and a lot more compelling than Colette not being very good at simpering about like a naive spoiled rich girl. The end of the novel is wrapped up very quickly, with Smithe figuring out not only the secret that was hidden in the book, but another even more valuable secret, one that he can’t live without. I want to read this book again, to pull more hints out of it. It’s enjoyable enough to read again, Smithe is a great character, I loved his interactions with his ex-wife Arabella, the plot is fast paced, the book is mostly dialog so it reads fast, and I liked what Smithe gets at the end of the story. So yes, a typically Wolfe novel – weird, enjoyable, I was left with more questions than answers, and I know everytime I re-read this book I’ll get more out of it. Also interesting is that Smithe leaves out chunks of conversations, saying he doesn’t remember what someone said or he does remember but it’s not important. I’ve noticed a lot of Wolfe protagonists do that. 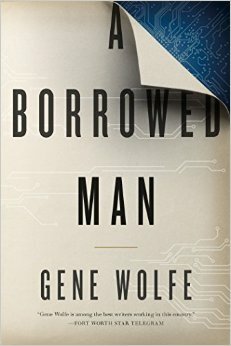 8 Responses to "A Borrowed Man, by Gene Wolfe"
I admit I started this book but I don’t think I made beyond about 30 pages. It just didn’t grab me at all. I guess I was in one of those reading moods where I NEEDED to be grabbed, you know? As opposed to those times when you’re willing to work harder at the book. It does have a slow, meandering start. I didn’t mind not being grabbed and pulled in, because I knew all sorts of weird Gene Wolfe stuff would be happening, so that was enough to pull me in. I think, based on your post, I’d prefer his The Book of the New Sun, of which I’ve only read the first two volumes. As for rereading, by the time I get around to doing that with a book, I often have very little memory of the book from the first time! I’ve only read the first two New Sun books too. a series that I’ll take 20 years to finish! For super short books, like novellas, if it’s really good, i’ll be reading it again start to finish about a week later. Easier to do with an 80 page novella! There is a sequel in the works. Wolfe does love his unreliable narrators don’t he? Ill be honest. I have only read SOME of The Book of the New Sun of Wolfe.